Stephanie Teslar, Head Bartender, Blue Hound Kitchen & Cocktails and LUSTRE Rooftop Garden Kimpton’s Hotel Palomar Phoenix, got her start as a barback in her hometown of Harrisburg, Pennsylvania, when she was just 17. Eventually graduating to the role of bartender at the upscale and old-fashioned steakhouse, she began mixing up classics cocktails. She later moved to Flagstaff, Ariz. to attend Northern Arizona University and it was there that she discovered her interest in wine and studied to obtain her introductory sommelier and certified specialist of wine (CSW) certifications while working in several wine bars. She helped open and run Criollo Latin Kitchen, a tequila and mezcal bar where she fell in love with spirits and cocktails. With this new interest in the creation of flavors, Teslar came to Phoenix to head up the cocktail program and bar at Blue Hound Kitchen & Cocktails and LUSTRE Rooftop Garden at Kimpton’s Hotel Palomar Phoenix in September 2012. She immediately began experimenting with flavor and accessibility in craft cocktails. Teslar loves using bold, bright local citrus, herbs from local farmers markets and has recently found a love of developing her own cocktail ingredients in the kitchen, experimenting with flavors that pair well with Blue Hound’s menu. Her use of local ingredients are highlighted in components like a McClendon’s Select blood orange syrup, homemade berry gastrique and her in-house infused gin, which features local white sage, sorrel, creosote, verbena and juniper. While curating a stand-out cocktail menu at Blue Hound and LUSTRE, Teslar has created countless memorable recipes, like the Baker's Dozen. 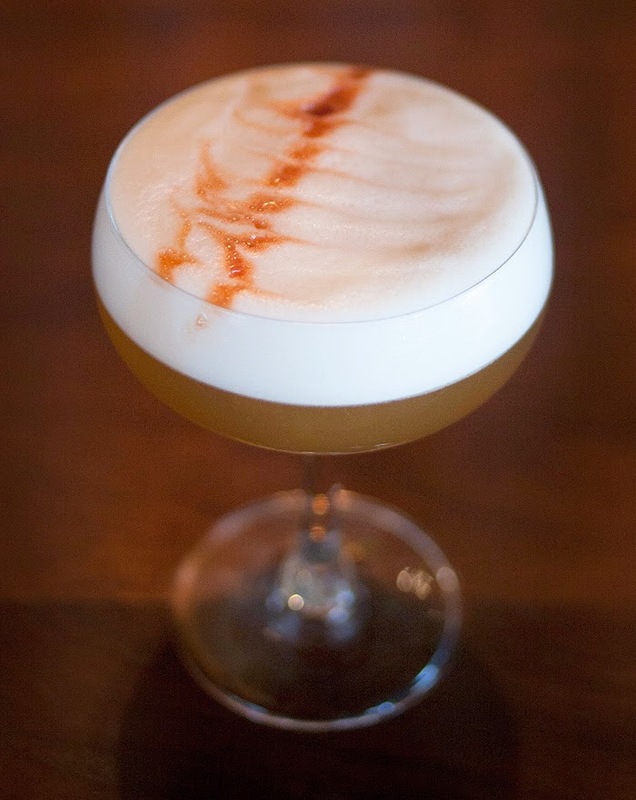 What she likes about it is that because all the flavors are somewhat approachable, you get the experience of the wonderful olorosso sherry and banana liqueur thrown into a summery “fizz” of sorts with the soda and egg white. You can expect a surprisingly light, confectionary, complex summer sipper! I love the trend of bartenders being creative! This is a wonderful example of what an artistic mind can do. I enjoy trying new cocktails! Intrigued bybthe sherry. I'll be giving this a try! Wow, I'd try this in a heart beat. Looks fantastic. I think that drink could be dangerous! LOL! I love this! I kinda want one right now! Too bad it's 6 am! LOL!